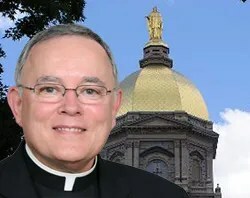 Our favorite Capuchin archbishop, Charles Chaput of Denver, has delivered another great address, this time to pro-life students at Notre Dame. Anyone else wonder how long Fr. Bryan Hehir and the archdiocesan climate of relativism and modernism would last if we had Archbishop Chaput in Boston? South Bend, Ind., Apr 9, 2011 / 07:10 am (CNA/EWTN News).- Archbishop Charles J. Chaput of Denver encouraged a gathering of pro-life University of Notre Dame students to be courageous in fighting for their beliefs and to always remember what being Catholic really means. “(W)e need to learn that not from the world; not from the tepid and self-satisfied; and not from the enemies of the Church, even when they claim to be Catholic; but from the mind and memory of the Church herself, who speaks through her pastors,” he said in an April 8 speech at the university. The devil, the archbishop said, “works in the present to capture our hearts and steal our future. But he also attacks our memory; the narrative of our own identity.” This is because our memory of history conditions our thoughts and choices in our daily lives. Catholics cannot exclude their religious beliefs from guiding their political behavior, because God sees that this “duplicity” is a kind of cowardice. This lack of courage wounds Christians’ individual integrity and also discourages others who try to witness publicly to their faith. Christians should act on their beliefs always with humility, charity and prudence, but also always with courage, he emphasized. “We can’t simultaneously serve the poor and accept the legal killing of unborn children. We can’t build a just society, and at the same time legally sanctify the destruction of generations of unborn human life,” he added. Abortion is no longer the only major threat to the right to life, which now faces a range of challenges including physician-assisted suicide, cloning, genetic screening, genetic engineering, and cross-species experimentation. Yet science accountable to no moral authority outside itself leads to “a hatred of imperfection” in real human persons, and the simplest way to deal with imperfections is to eliminate the imperfect. Science and technology are “enormously powerful tools” but they can undermine human dignity just as easily as they can advance human progress.